Last summer, Philly’s theater scene suffered a significant hit when the Philadelphia Shakespeare Theatre suspended its mainstage productions after its 20th season, citing spiraling costs and lack of donor support. The company, which had mounted some of the best-received productions of Shakespeare in the region, didn’t disappear. This month, the company brought a streamlined, minimalist 90-minute production of Hamlet to 25 public, private, and parochial schools in the region. The tour will be followed May 10 with a public performance of the abridged production at the Free Library of Philadelphia. 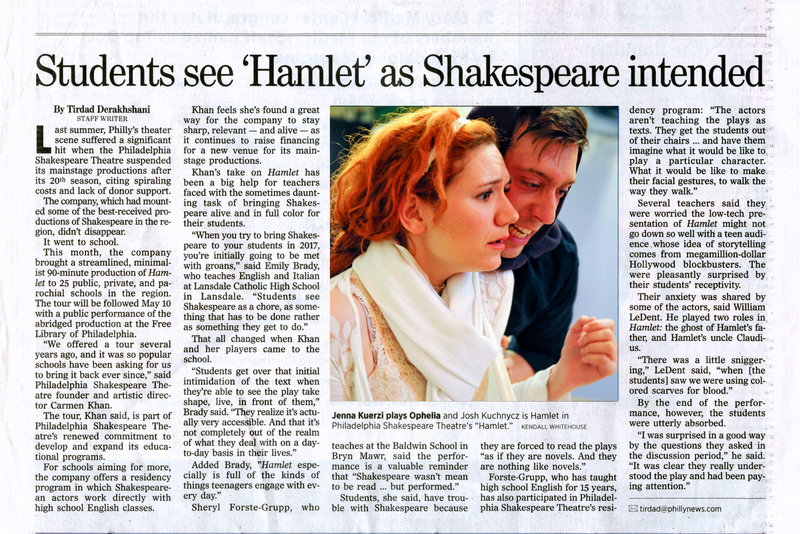 “We offered a tour several years ago, and it was so popular schools have been asking for us to bring it back ever since,” said Philadelphia Shakespeare Theatre founder and artistic director Carmen Khan. The tour, Khan said, is part of Philadelphia Shakespeare Theatre’s renewed commitment to develop and expand its educational programs. For schools aiming for more, the company offers a residency program in which Shakespearean actors work directly with high school English classes. Khan feels she’s found a great way for the company to stay sharp, relevant — and alive — as it continues to raise financing for a new venue for its mainstage productions. Khan’s take on Hamlet has been a big help for teachers faced with the sometimes daunting task of bringing Shakespeare alive and in full color for their students. That all changed when Khan and her players came to the school. Several teachers said they were worried the low-tech presentation of Hamlet might not go down so well with a teen audience whose idea of storytelling comes from mega million-dollar Hollywood blockbusters. The were pleasantly surprised by their students’ receptivity. Their anxiety was shared by some of the actors, said William LeDent. He played two roles in Hamlet: the ghost of Hamlet’s father, and Hamlet’s uncle Claudius. By the end of the performance, however, the students were utterly absorbed.